Geology of the Himalayan Belt: Deformation, Metamorphism, Stratigraphy presents sophisticated metamorphic and igneous rock data across various Himalayan geographic sectors, capturing their petrography, metamorphism, structure, mineralization, and regional tectonic research. With an east-west extension of about 3000 kilometers and numerous 8000 meter peaks, the Himalayas are the most spectacular mountain ranges on earth. Since the 19th century, they have provided a testing ground of global importance for the development of geodynamic concepts, from isostasy over continental collision, to more recently, feedback mechanisms between tectonics and climate. 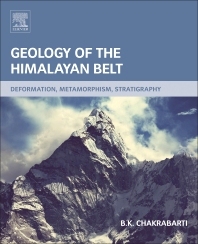 This book collects the broad range of data that’s been gathered on the Himalayas over the past 50 years, providing a comprehensive analysis and interpretation on the available data that brings the scientific community a better understanding of the geological diversity and structure of the Himalayan belt, along with new techniques that have applications in a host of global geological settings. B.K. Chakrabarti Ph.D. is an Emeritus Scientist with the Geological Survey of India and a Sir J. Coggin Brown Gold Medalist for his work on Precambrian geology. Dr. Chakrabarti served with the Geological Survey of India for 35 years and has published more than 30 articles on the subject. He was also a Fellow at the W.B. Academy of Science & Technology in Kolkata, India. Now retired, Dr. Chakrabarti is also editing a book on the Precambrian of the Indian Peninsula to be published by the Indian Journal of Geosciences.